TZ Tapes for Brother P-touch models PT-300, 320, 330, 340, 530, 540, 580C, 1000, 1100, 1180, 1200, 1280, 1400, 1650, 1750, 1800, 1800+, 1830, 1900, 1950, 2200, 2300, 2400, 2420PC, 2500PC, 2700, 3600, 9200DX, 9500PC & 9600. Black print on a White background laminated tape for use with Brother P-Touch label printers. Brother P-Touch label tape cassette 6 mm x 8 metres. 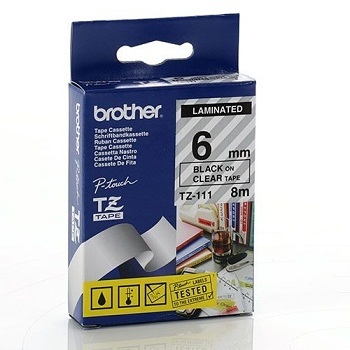 Black print on a Clear background laminated tape for use with Brother P-Touch label printers. Black print on a Yellow background laminated tape for use with Brother P-Touch label printers. White print on a Black background laminated tape for use with Brother P-Touch label printers.